Although I wrote everything I know about squirrel issues for this website, oftentimes a problem with squirrels in the attic is beyond the scope of the do-it-yourself homeowner to solve. I have found a professional company in Springfield, Massachusetts that handles problems with wildlife. 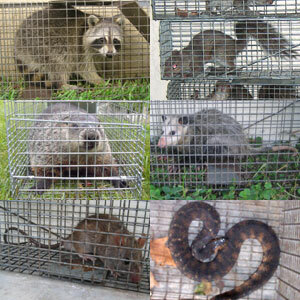 AAAC Wildlife Professionals has access to tools, techniques, and experience that help them do a far better job at wildlife removal than a non-experienced homeowner could. They possess licensing that allows them to do certain types of work legally, that non-licensed homeowners in the state of Massachusetts are not allowed to do. For the welfare of your situation, and the squirrels, in some cases it's best to hire a pro. There are good companies and bad companies out there. I've done research on such companies, to get to know them, and feel confident recommending their services. I therefore recommend a company called AAAC Wildlife Professionals which services Springfield, Massachusetts. If you have a squirrel problem, or any other conflict with a wild animal, and live in Springfield, I am confident that this company, AAAC Wildlife Professionals, is the one to call. I asked the company to describe their service range, and they said this - We also provide wild animal control in the following towns: Greenfield, Deerfield, Montague, Gill, Wilbraham, Agawam, Hampden, Longmeadow, East Longmeadow, West Springfield, Chicopee, Holyoke, Granby, Palmer, Ludlow, Monson, Warren, Ware, Hadley, South Hadley, East Hampton, Northampton, Amherst, hatfield, Belchertown, Pelham, Williamsburg, Whately, Sunderland, Leverett, Shutesbury, New Salem, Petersham, Phillipston, Athol, Templeton, Gardner, Winchendon, Royalston, Orange, Warwick, Erving, Northfield, Bernardston, Leyden, Colrain, Shelburne, Conway, Ware. AAAC Wildlife Professionals operates 24/7, so don't hesitate to call at any time to discuss your wildlife problem, and schedule an appointment for same-day or next-day service. Hi David, I live in Massachusetts and I have a squirrel problem. I made my own one way exit trap, and I put it against a hole and sealed every where on the house, but they gnawed out a new hole instead of going out the one way exit. I made it out of chicken wire and the door closes as they walk through it ,but I didn't put a spring on door. I just angled the door, so when they walk through it closes and they shouldn't be able to go back that direction. I am thinking of making a second trap to put at new hole. I did see a squirrel the past week pop his head out, but in the past had rats and killed them off and seal holes, but now I have two new holes. I hope I don't have rats with the squirrels and if I do does will this trap work the same way for rats or do I have to put poison at the holes .My attic is very small there is no way after I get rid of the rodents to clean urine and feces in attic, the attic barely fit ac ducts. Is there something maybe I could spray at the holes before I plug them up after I catch the rodents, so there pheromone smell don't attract them back. I am frustrated all my money is into this house and I can't afford the damage. I don't want to kill squirrels, but I am getting desperate and I almost bought poison peanuts for moles and thought of using that. This whole thing is depressing and driving me crazy. I can't believe how fast they gnawed out a new hole where there was no hole before. Any input would be great ,thanks. P.S. should I throw some fruit in the trap to try to get them to go through the one way exit. If you have a squirrel problem in Hampden County Massachusetts, or any other conflict with a wild animal, I am confident that we can solve it. We use humane methods when dealing with Springfield wildlife removal situations. Squirrel Control Springfield. Our company is fully licensed and insured in Massachusetts. Call us any time at 413-372-1777 for a price quote and to schedule a same-day or next-day appointment to solve your squirrel problem in Springfield.